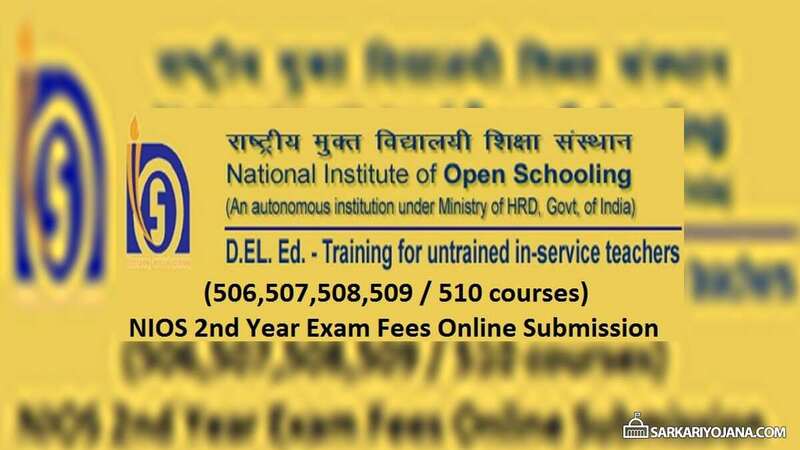 The 3rd NIOS public examination for D.El.Ed will be held in 2 modules i.e 506 & 507 during December 2018 and 4th NIOS public examination for D.El.Ed will be held in 3 modules i.e 508, 509 & 510 modules during February-March 2019. All question papers will be bi-lingual which means in both English and Hindi languages and also in selected regional languages. However, applicants can write examination in any 1 language for which he/ she has to write the medium / language of answering questions on the specified space in the Answer Book. Here candidates have to provide the Enrollment number of D.El.Ed examination and then click at the “Submit” button to move further. Then candidates have to select the Medium and then it will ask for percentage in class 12th. If percentage is less than 50% for general category and 45% for other category then have you taken admission in NIOS, select Yes or No. If candidates has taken admission in Class 12th then provide Reference number / Enrolment number. Then click at the “Submit” button to get redirected to online payment. In case of successful payment, applicants will get a message and candidates can take a printout of the same. The status of payment can be checked by just providing enrolment number. In case the payment has been debited from your account and the status has not been updated, kindly do not make payment but just wait for 48 years. The payment status will get updated and applicants can check their status by providing their enrollment number. The last date for submission of second year examination fees for course 506, 507, 508 and 509 / 510 courses is 15th October 2018. Only those teachers who have submitted 2nd year admission fees earlier can only submit the examination fees before the specified last date. Sr mera 504,505 ke paper ki fees submit Ni Ho payi thi to exam ni de pai Mai,to kya iska back k sath paper hoga or Mai 2nd year ki fees submit kar sakti hoon. 1000/for.3rd and 4th exam in D. Ed. my status showing payment is completed. opted subject status is not showing. kindly give solution. my Enrollment number. 12060000008001. I had given my exam fees. but opted subject is not showing in my status. 506,507,508,509.my.Enrollment No. 12060000008001.